SYNCO, which specializes in blockchain and token sales, is planning to launch a new cryptocurrency exchange called ‘ChainB’. Not only does this exchange offer discounts in commission from transactions, but it also distributes part of profits earned from commission back to its community as compensation. SYNCO is also planning to tie ChainB to payment services that can be used in actual economy. While a trend of having an exchange issue its own tokens is receiving spotlight just like sudden growth of FCoin, it will be interesting to see whether this trend will change the landscape of South Korea’s cryptocurrency ecosystem centered on large crypto-exchanges. According to industries, SYNCO recently finished two rounds of pre-sale of SYNCO Coins and is working on public sale of SYNCO Coins. Public sale will take place until the 19th and there is no limit to maximum amount needed for participation. SYNCO is also preparing to launch its exchange ‘ChainB’ that is based on SYNCO Token, Bitcoin, and Ethereum. SYNCO started off as a small information community related to blockchain and ICO (Initial Coin Offering) and had carried out institutional investments (private sale) into promising ICOs. Instead of commission, it has made bonus from institutional investment that is calculated to be about 10% as its profit. It holds large conferences every month by inviting representatives from promising ICOs and issues ‘ICO Cloud’ magazine monthly according to characteristics of its members. It has expanded its business through platform business and it announced various services such as ChainB, ICO launching platform ‘SYNCO Launch’, blockchain startup accelerator ‘SYNCO Lamp’, SYNCO Token-based card-type payment system ‘SYNCO Pay’, and ‘SYNCO Pool’ that pays compensation to its community by saving part of profits from SYNCO. ChainB exchange will be operated through SYNCO and an independent corporate and it can be used by anyone regardless of his or her citizenship as it excluded legal tender from a list of key currency within itself. SYNCO is going to list ICO project tokens that had gone through SYNCO Launch first. SYNCO Launch is an ICO platform that allows anyone to participate in an ICO regardless of amount. Individual investor can also participate in a foreign ICO without having to go through complicated procedures. SYNCO looks for promising ICO projects and verifies them in advance through SYNCO Launch and puts out corresponding tokens to markets through ChainB. From ICO project’s perspective, it can reduce its financial burden. Investors can also reduce amount of risks that occur when ICO projects do not get listed at exchanges after completing ICO. Discounts are applied whenever investors pay commissions through SYNCO Tokens. Part of profits from commission is stored within SYNCO Pool and is compensated back to SYNCO’s community. SYNCO Pool prevents manipulation market value that occurs from high-frequency trades that use algorithms as it limits number of trades per hour into its API (Application Programming Interface). SYNCO is also planning to launch SYNCO Pay that is tied to a real-time cryptocurrency payment card project called FuzeX. 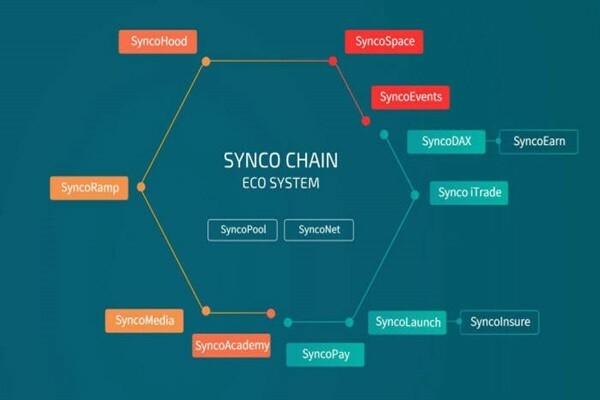 Its plan is to introduce a payment system that is connected to daily life so that members of crypto-communities can utilize various SYNCO Chain services.